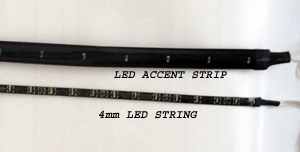 Our NEW Multi Pak LED String & Strip kits are designed for motorcycles & ATVs. The ultra thin (about the thickness of a dime)flexible LED strips mount anywhere and are in lengths to fit under the gas tank (12" longer strips) and along the battery cover (8" shorter strips) to make the engine glow. In all 6 hot colors. LEDs use virtually no power and can be run for hours with the bike off to give a cool parking lot glow while you have a cold one! Super cool kit!